Listed on the National Register of Historic Places, the turn-of-the-century Palm House at the Franklin Park Conservatory is an extraordinary Victorian glass structure that houses an equally extraordinary botanical collection. However, more than a century of use had caused the Palm House to outgrow itself—making new space for special events and catering critical. There was also a need for a separate entrance that would offer special events attendees "private” access to the facility. Schooley Caldwell’s design team created new infill additions to complement the Palm House and enhance its ability to house several events simultaneously. 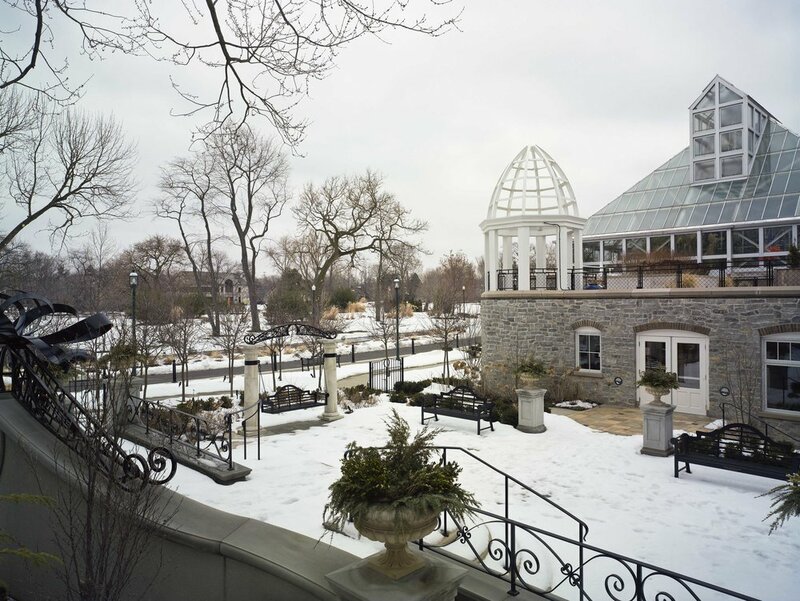 The resulting additions—which include two roof gardens, a Bride’s garden, a 150-person special events room, storage, and support spaces such as a catering kitchen, restrooms, etc.—create more than 20,000 square feet of revenue-generating space for the Conservatory. The design for the dual additions echoes the Conservatory’s Palm House through the use of materials such as rough-hewn stone and ironwork. Belvederes incorporated into the design on either side of the roof gardens are informed by the historic main entrance to the Palm House. In order to make the Palm House easily accessible from two levels, a new steel and glass elevator was added. The project presented significant challenges: the Conservatory had to remain open with minimal disruption to general visitors during construction, and special events such as weddings needed to go on as planned. The Palm House itself contains a valuable collection of plants that had to be protected from construction dust and that had to remain under climate-controlled conditions at all times throughout the project.